CSIRO scientists in Far North Queensland sought help from the public in attempting to locate tens of thousands of spectacled flying foxes that took flight in the aftermath of Cyclone Larry. They are investigating how flying foxes have responded to the habitat disturbance caused by the cyclone in March 2006. A large proportion of these animals relocate in winter and spring, but in 2006, they left up to three months earlier than usual, about a week after Cyclone Larry. 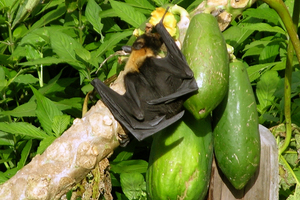 The bats normally roost by day and feed at night, but after Cyclone Larry they were seen in flight and feeding in the afternoon daylight, which suggests that these typically nocturnal animals took greater risks to get sufficient food.